Jonathan and Martha Kent are trying to deal with the fact that their son can now defy gravity. This new development initially scares Clark and makes him feel more alien than he already did. Jonathan finally devises a way to control what is happening and Clark is delighted with his new power. Story - 5: First off, I loved this story. In fact, this is the best Superman related comic I have read in years. Part of me thinks that I shouldn't have. For one thing I have a beef with Max Landis but I put all of that to the side because there is a difference between making a video which wrongly trashed one of my favorite storylines ever and writing a story about a young Clark Kent. It would have been terribly unfair to judge this series and this issue by that video. From the various interviews I have seen and read Max Landis comes off as having a genuine love for Superman as a character. I'm not sure I agree with everything he says about Clark and Superman and all that but there is an integrity to his comments that makes me believe them. Secondly, this story covers an aspect of Clark's upbringing that has been mined repeatedly over the past decade and a half. SMALLVILLE's early seasons was fueled by angst and Clark feeling like he didn't belong. 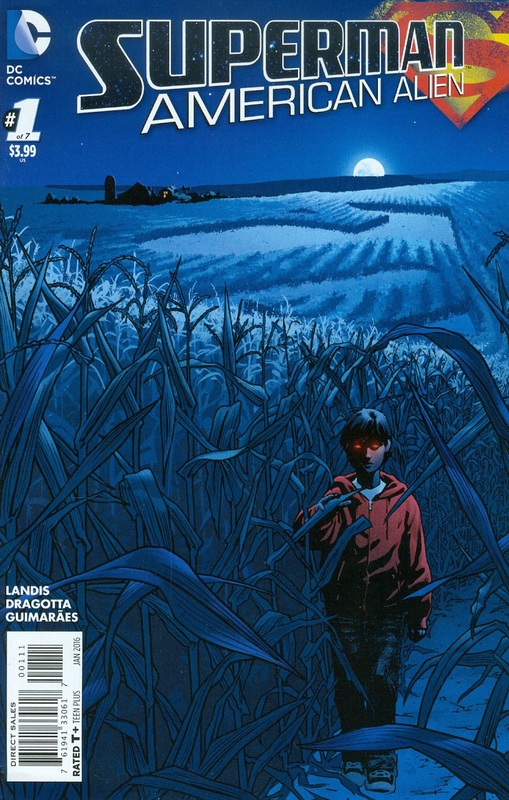 SUPERMAN: SECRET ORIGIN and SUPERMAN: EARTH ONE both took a shot at showing us what growing up as a kid with super powers was like for young Clark Kent. One of my favorite scenes in MAN OF STEEL was Martha having to come to school to talk Clark down after his x-ray vision kicks in and freaks him out. What elevates this story and makes it work is that it feels honest. I don't get the sense that Landis was coming from the tired cliché of "well, he's an alien so OBVIOUSLY he must feel alienated." As scared and confused as Clark was at various points in the story Landis never lost sight of the fact that while defying gravity would initially freak you out once you got everything figured out it would also be the coolest thing ever. Clark's reactions to this new ability were all on point but what made them work was the payoff at the end of the issue where he is sitting at the kitchen table babbling like a little kid after learning to ride his bike and realizing that he isn't limited to his own backyard anymore. This isn't a young Clark Kent acting like a petulant teenager coming down the stairs in a Superboy uniform saying that he is never going to wear this again. This is a young Clark Kent that is embracing who he is by focusing on how awesome it would be to fly. The main selling point to this is how Max Landis handled the Kents. They are much younger in this story, which is fine by me. I am not picky when it comes to the ages of the Kents. Whether they are much older, like in most versions of the story or in SUPERMAN: THE MOVIE or younger like on SMALLVILLE the age of the Kents is not as important as the role they play in raising Clark Kent. Landis' take on the Kents is right on the money and I love how they go out of their way to help their son through a very difficult time. The conversation Clark and Jon have in the truck after the incident at the theater was so honest and real that it got me a little choked up. I appreciated the two pages at the end of the book that gave us a little insight into the type of people this version of the Kents were before finding Clark. I want to learn more about Jonathan as a lawyer and Martha as a vet and why they chose to be farmers. We probably won't get that but I'm still curious. It was nice to like this comic as much as I did. I am not sure I will feel the same way about the rest of the series as I get the feeling that the tone will change from issue to issue but this was such a great read. Landis showed us something we've seen in past iterations of the legend and made it feel fresh and new. This is the best Superman related comic I have read in years. Art - 4: While Nick Dragotta's style is not what I usually like in a comic it was perfect for this story. Dragotta packs so much emotion into every panel and it really made me feel what the characters were feeling. Was it cartoony? Yes, but that didn't matter to me. The only thing that I didn't like was the design for Pete Ross. I'm sure there was a reason for him to look the way he did but it wasn't for me. Other than that the art was top notch and really added to my enjoyment of this issue. Cover Art - 2: Artistically this cover is fine. It's moody and everything looks like it is supposed to. My problem with it stems from the fact that it completely misrepresents what the story inside is about. I get that they are trying to sell books and that someone in DC editorial and/or marketing has it in their head that the angry glowing red eyes of anger is a good selling tool. For all I know they have charts and graphs and Excel spreadsheets that point to this fact but it doesn't serve the story inside the book at all. It makes you think this is going to be a horror story, which is extremely misleading. Variant Cover Art - 4: In contrast to the main cover I really liked this variant. I am a bit confused why this was relegated to variant status when it feels closer to the story inside than the cover they went with. 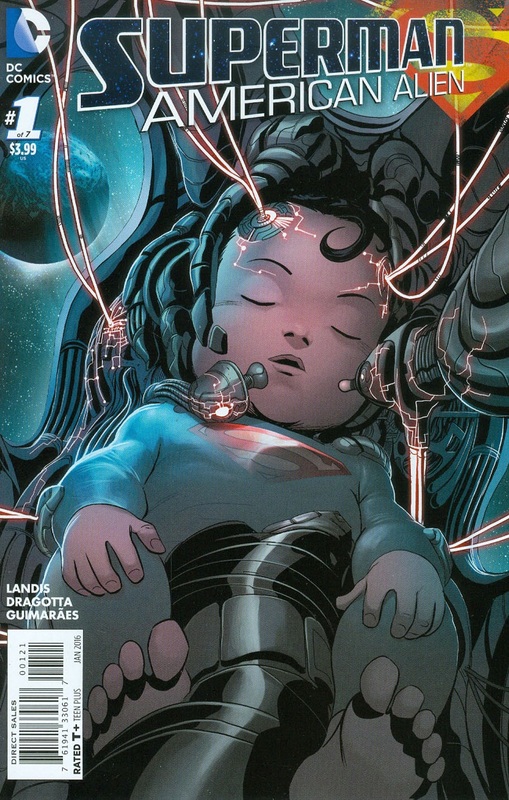 The shot of baby Kal-El sleeping as his ship travels through space is sweet and makes me feel more for him as a character than walking through a corn field looking all ominous.